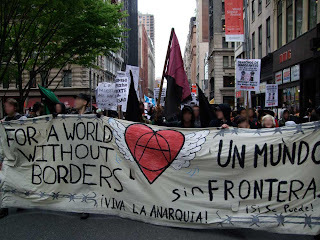 New York, New York U.S. – Anarchists in New York City took part in traditional labor and immigrant rights marches that began in Brooklyn and Manhattan's Chinatown and converged in Union Square, before rallying near the Jacob K. Javits Federal Office Building that houses U.S. Citizenship and Immigration Services (USCIS). Overnight anarchist graffiti appeared outside banks, real estate brokerage offices and other businesses in both Manhattan and Brooklyn. Windows at a Prudential Douglas Elliman Real Estate office in Williamsburg, Brooklyn was among those shattered by vandals. 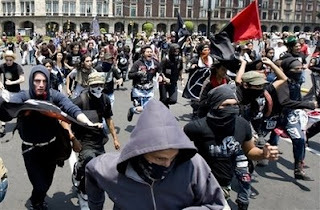 Olympia, Washington, U.S. – A bloc of black-clad anarchists left an authorized immigration rights May Day march and attacked banks and the state capitol building. The windows of two banks were smashed, despite the fact that customers and employees were inside. The group also allegedly attacked police officers who tried to stop them. Police used pepper ball guns against marchers. Government business was temporarily disrupted and windows were broken as dozens of protesters burst into the legislature chanting anti-state and pro-immigrant slogans. Protesters left without arrest, but left their demands such as "Burn the Capitol" on the building's walls. Six people were arrested throughout the day, including an individual who was also arrested at a riot at Evergreen State College in February. 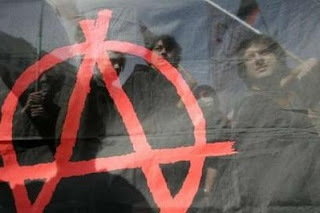 Mexico City, Mexico - Anarchists also marched in observance of May Day in Mexico's capital. 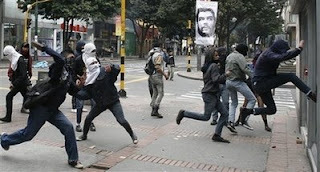 Bogota, Colombia - Radicals attacked a bank and smashed windows during demonstrations in the Colombian capitol. 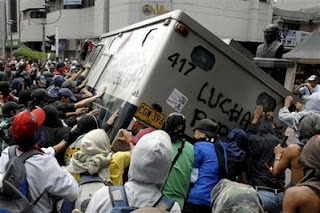 Medellin, Colombia - Demonstrators attacked and overturned an armored truck, during an unruly protest in Colombia's second largest city. 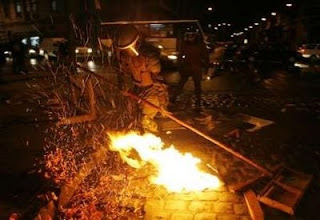 Valparaiso, Chile - Anti-capitalist rioters clashed with police, and built barricades in the streets of Chile's unofficial capitol city on the eve of May Day. Santiago, Chile - Hooded protesters destroyed state property, attacked police and their armored vehicles. At least one police officer was injured and 96 protesters were detained during the violence. Seoul, South Korea - Students and police clashed during an anti-government march to mark the holiday. 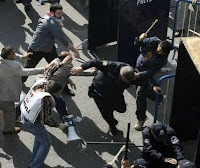 Ankara, Turkey - Unionists and other protesters exchanged a steady flow of projectiles with riot police. One officer was disarmed and beaten with his own club. 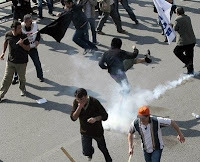 Police used chemical weapons, causing at least one demonstrator to be sent to the hospital. The May Day holiday has banned in Turkey since the Taksim Square massacre of 1977. 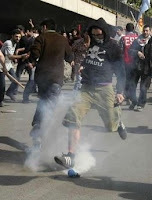 Istanbul, Turkey - Unionist as well as anarchists fought street battles with police. Authorities tried to shut down unpermited May Day observances that were planned to take place in Taksim Square. Moscow, Russia - Anarchists demonstrated and danced with the help of a portable sound system within sight of the Kremlin. They joined thousands who came out to protest and decry rising food prices that have been affecting poor people around the world. Hamburg, Germany - Anti-fascists clashed with police and blocked roads and train lines in order to disrupt a neo-Nazi march. 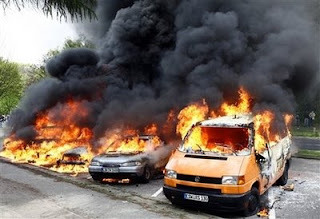 Leftists and anarchists attacked neo-Nazi buses and cars smashing up and torching more than a dozen of them. Twenty Police officers were reported injured, and approximately 250 rioters were detained. Some journalists were also injured at the hands of the extreme right-wing marchers. The riots were the most intense the city has seen in years. Similar riots took place in Berlin and Nuremberg. Switzerland - Tens of thousands rallied and marched in cities across the country in support of increased wages and more favorable labor conditions. Unrest broke out in Zurich, where anarchists and others ran riot outside of the officially sanctioned rally. Approximately 300 people were detained during the violence, and two people were injured - one seriously - as a result of an automobile accident. Lausanne, Switzerland - Anarchists were the only ones to organize a demonstration. They led a march of hundreds through the downtown area and smashed the windows to businesses including a McDonald's. 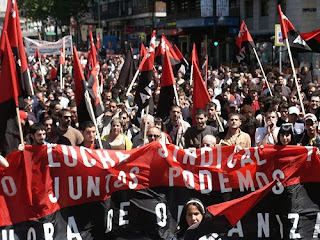 Madrid, Spain - 25,000 people marched to demand economic reform including many members of large anarchist trade unions.